The Intrepid's RAD-SuperMoon is the most advanced media converter for Automotive Ethernet applications. 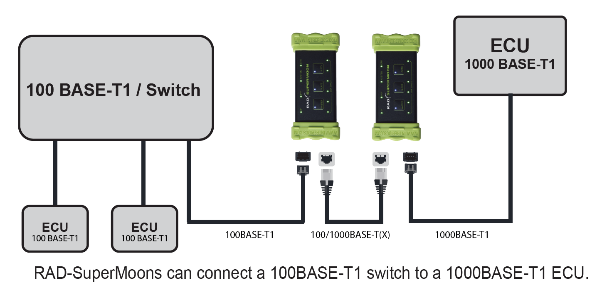 Using the RAD-Super Moon, you can convert from 100/1000BASE-T1 Automotive Ethernet to standard 10/100/1000 Ethernet, useful for connecting a PC to a 100/1000BASE-T1 host or switch. 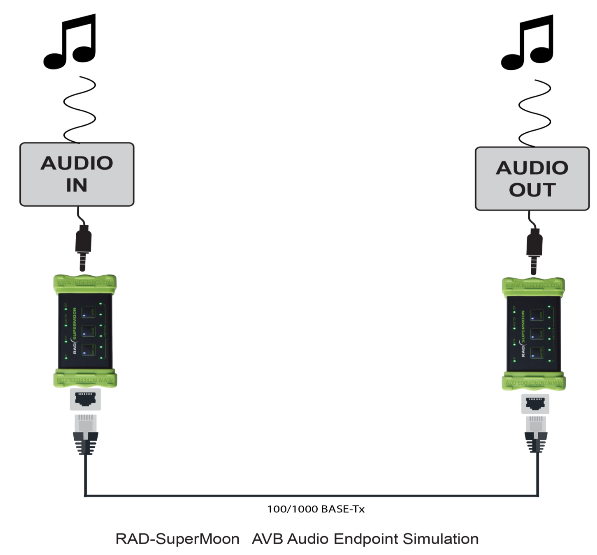 The RAD-SuperMoon includes AVB/TSN endpoint simulation(talker or listener) using USB 3.0. 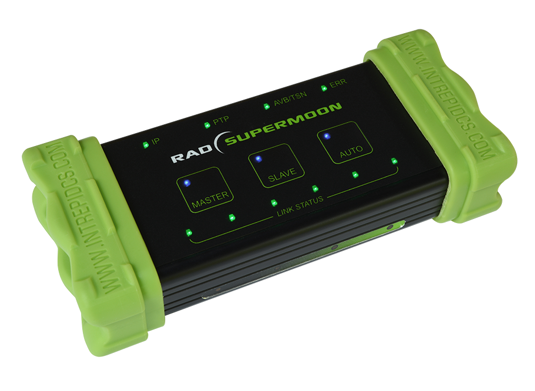 Two RAD-SuperMoons can also be used as a pair to implement an active tap, allowing you to monitor traffic on a 100/1000BASE-T1 link between two ECUs or an ECU and a switch port. 100/1000BASE-T1 using the Marvell 88Q2112 PHY. Programmable membrane label with LEDs to show PHY and network status. Membrane switches allows switching between 100BASE-T1 and 1000BASE-T1, and selecting master, slave or automatic PHY configuration. Yses the TE MATEnet connector specially designed for 1000BASE-T1. Connect two RAD-SuperMoons to make an active tap that copies full-duplex communications between two hosts or a host and switch port with very low latency. Configure and monitor PHY registers via USB 3 (USB 3.1 Gen1, 3.2 Gbps). View network activity on a bar graph. Configure AVB audio endpoint as a talker or listener. 4.5-40V power range, compatible with in-vehicle power. 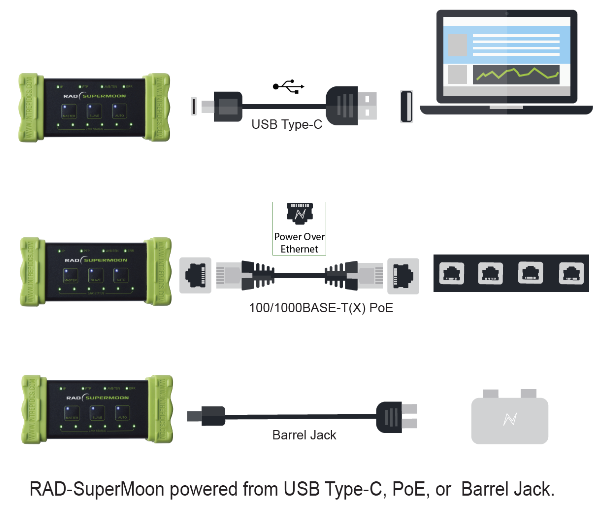 The RAD-SuperMoon can act as a media converter, allowing a PC to interact with 100/1000BASE-T1* ECUs. This allows you to simulate nodes or perform direct diagnostics or ECU flashing. In addition, the “pure” media converter mode disables encapsulation of messages and allows connections between media of differing bit rates, buffering as needed. * BroadR-Reach® devices also supported. 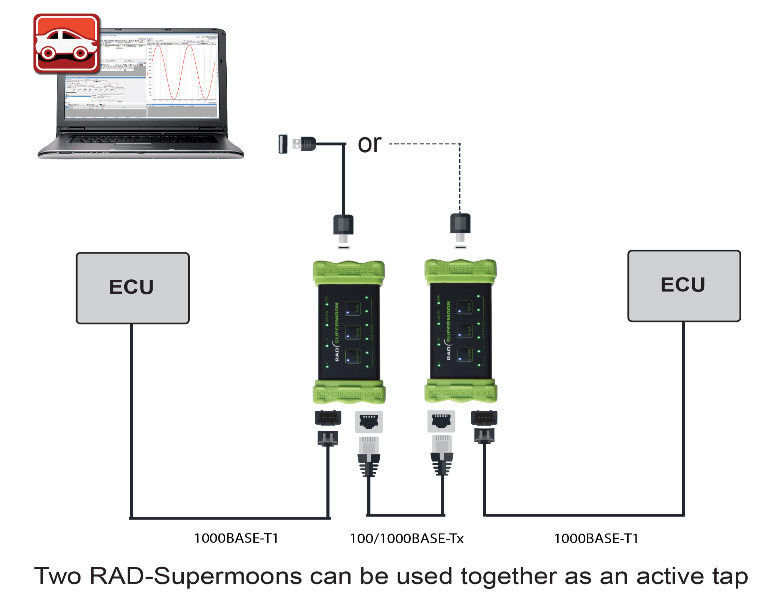 A primary use of the RAD-SuperMoon is to act as an active tap, transparently interposing itself between a pair of 100/1000BASE-T1 Automotive Ethernet devices. This can be either an ECU-to-switch or ECU-to-ECU link. The traffic from each device on a tapped link is forwarded to its partner, ensuring seamless operation of the network. 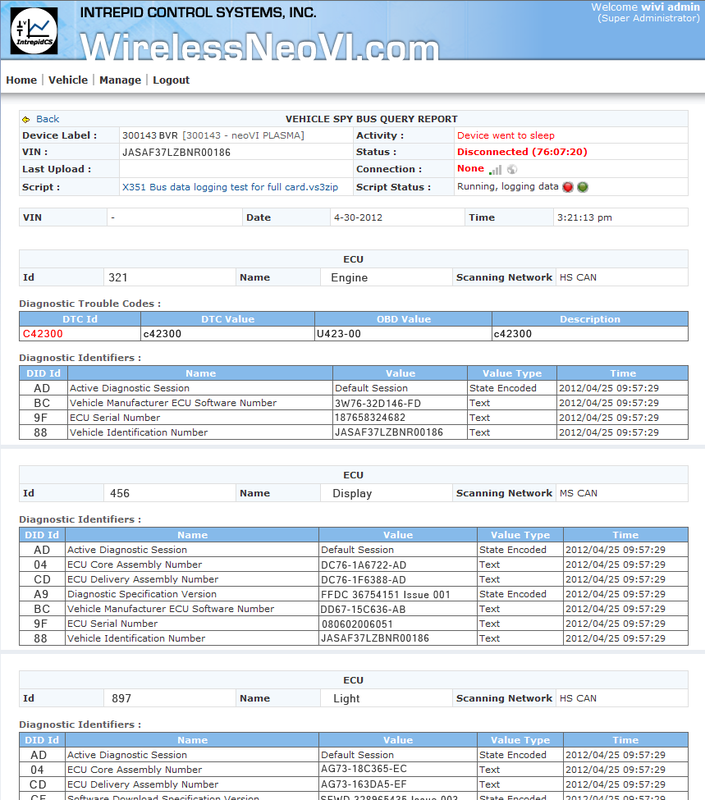 Copies of all messages are also aggregated and sent to the PC over the RAD-SuperMoon Gigabit Ethernet link, where they can be analyzed using Vehicle Spy Enterprise software. ​ The RAD-SuperMoon can be configured as an Ethernet Audio Video Bridging (AVB) audio/video endpoint, acting as a talker or listener. This allows seamless audio/video delivery throughout the network.